Having seen the Gwen Stefani wedding dress last weekend I was intrigued by the idea of spray paint. 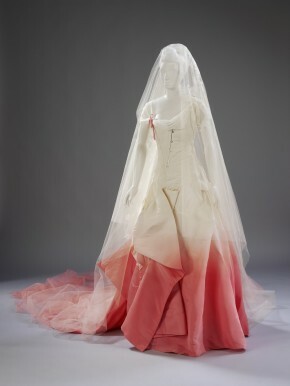 The hem of her dress, which appears to be dip dyed silk, is actually coated in pink spray paint. So this idea has been nagging me all week, and I was excited when I got the chance to give it a try. 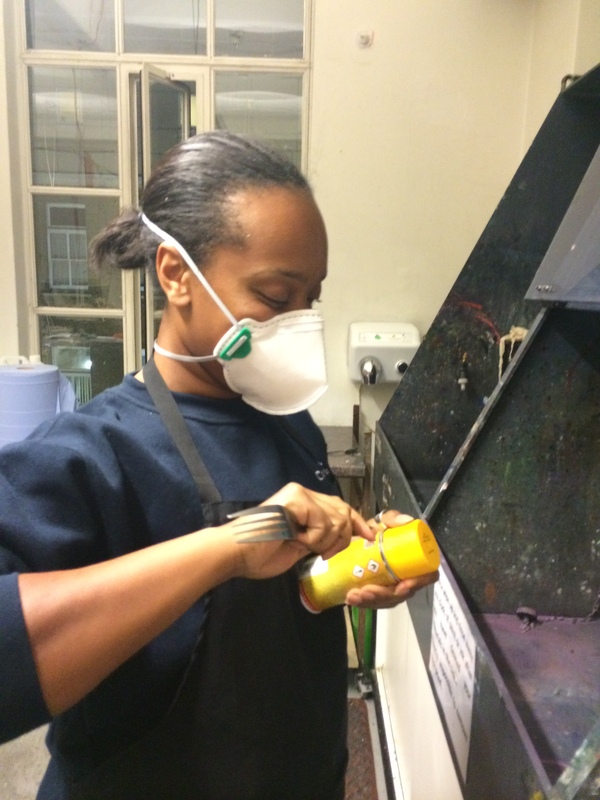 At Mary Ward Centre they had some spray paint in green, pink, blue and deep yellow. 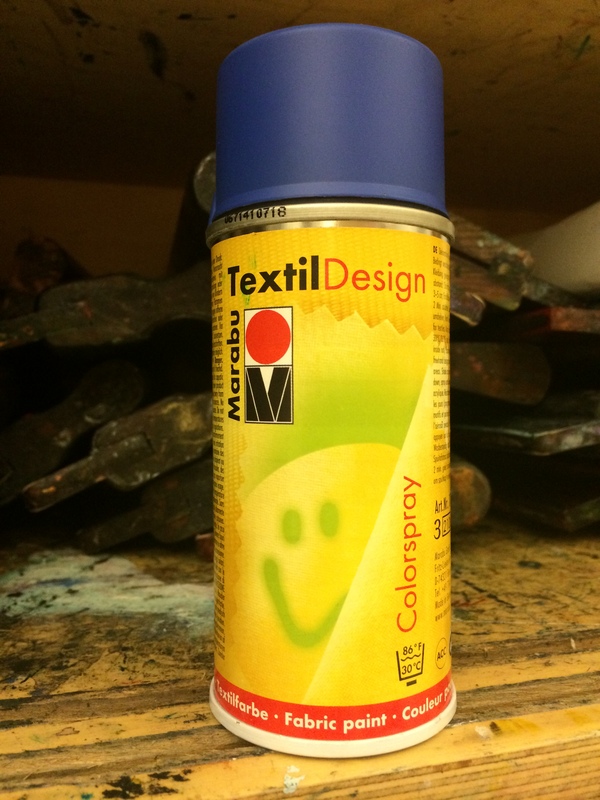 This is not car colour spray that I believe is used by graffiti “artists”, but is specifically made for textiles. It is fast, but apparently not good enough for frequently washed items. 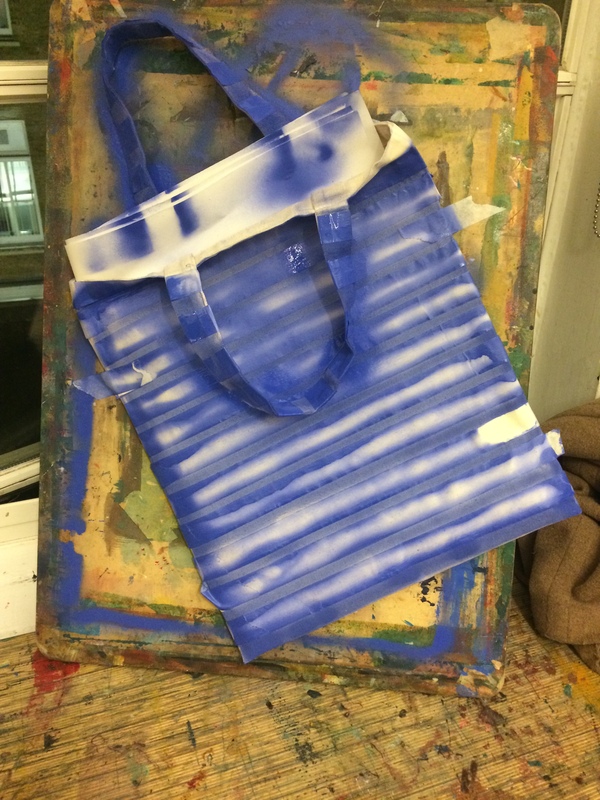 I decided to try it out on a cheap (£1.50) canvas bag. I use a lot of these bags, which I end up buying rather than a plastic “bag for life”. I also seem to accumulate free, branded ones at exhibitions. I put my dressmaking projects in bags like this and hang them on our shaker peg rail. It keeps the project out of the way and holds the pattern pieces and left over fabric together until the project is finished. 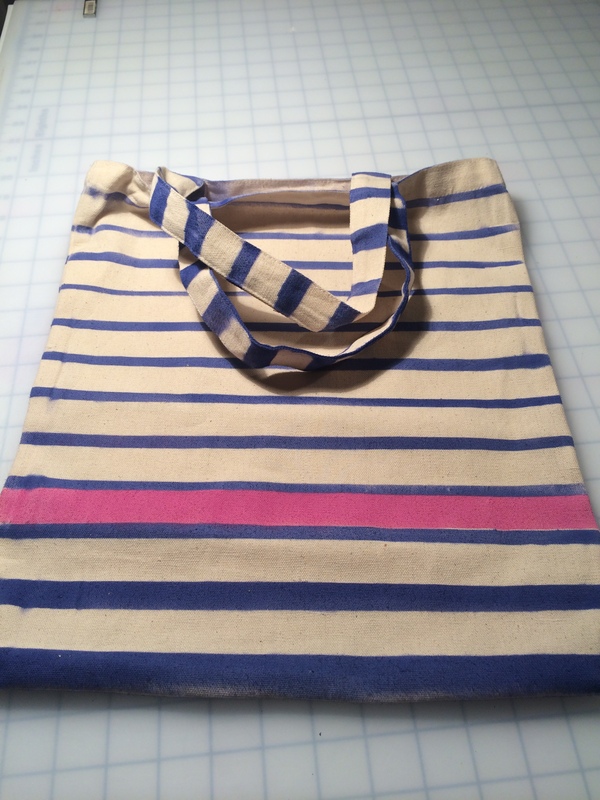 I wrapped the canvas bag in strips of masking tape without measuring the gaps, to create an all over stripe. Other students used freezer paper to create wonderful designs. We had to use the extraction cabinet and face masks as apparently the fumes are dangerous. It certainly smelt quite strong. Here is one of the students ready to spray! I put folded newsprint inside the bag to protect it during spraying, and taped the canvas to a wooden board to hold it upright inside the extraction cabinet. I sprayed each stripe and the handles, one side at a time, leaving it to dry in between. I had to redo certain bits to ensure effective coverage. In reference to Gwen I added one pink stripe. 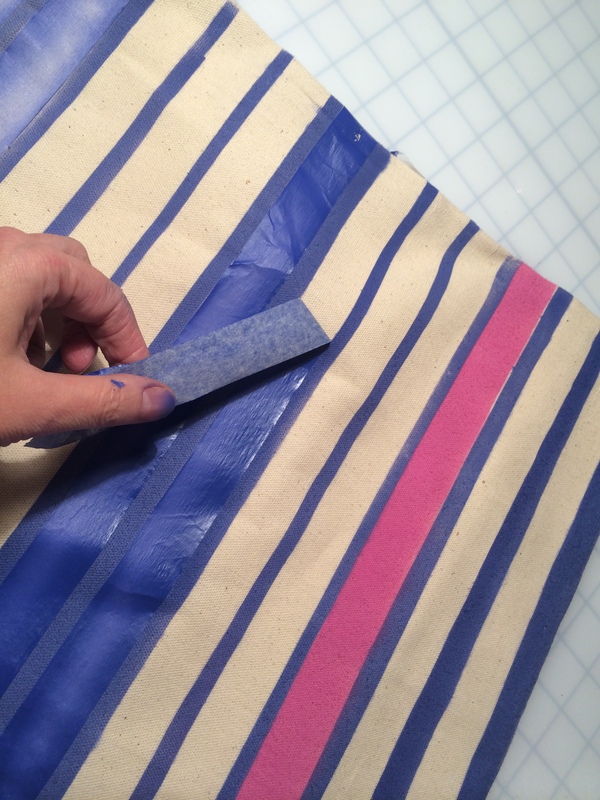 I exposed one white stripe by removing the masking tape, then taped the blue stripes above and below it, then covered the rest of the bag with newspaper to protect it from the pink spray. 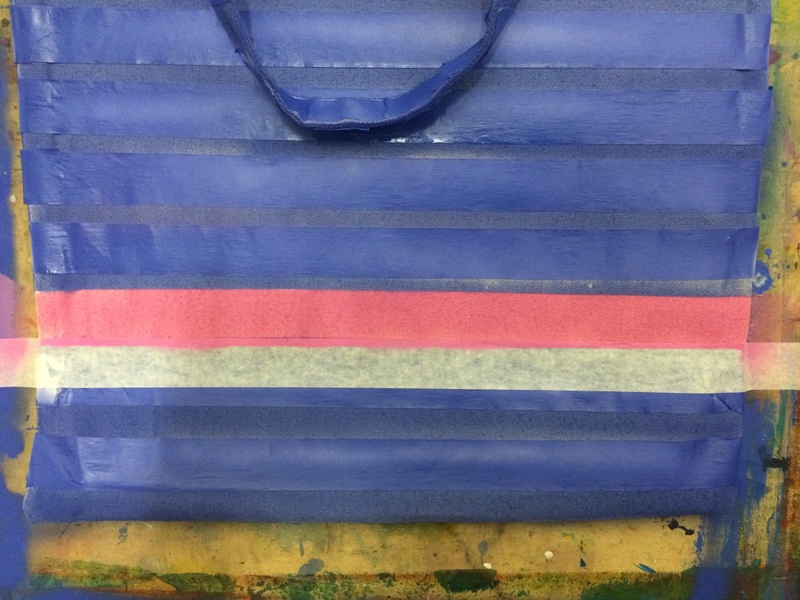 Then it was sprayed on the front and back so the pink stripe runs round the bag, as do the blue stripes. I left the bag to dry, and was able to remove the masking tape when I got home. It was pretty exciting pulling off those strips, let me tell you! The finished bag looks quite sweet with its flash of pink and striped handles, made by sticking masking tape squares at regular intervals. * Calling a spray painted £1.50 bag after a muse is a joke. I just thought I had better say that in case you thought I was incredibly sad or pretentious. I often worry that people will think I’m pretentious. You’re quite funny, Kate – never pretentious. Love your creativity. That looks like a lot of fun, I must get some. A great idea. Love how your bag turned out. Another project I could love! Your bag is incredibly cheerful. It sounds like it was a very satisfying project.